There’s more than meets the eye to the ship’s captain in ‘Hotel Transylvania 3’. 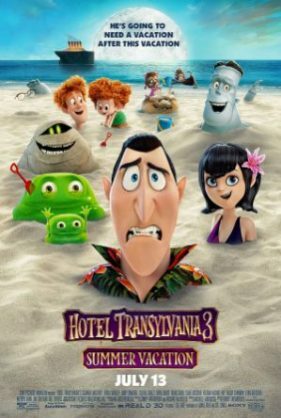 Among upcoming cinema releases, Count Dracula and his family set off on a leisure cruise for monsters in “Hotel Transylvania 3: Summer Vacation”, Dwayne Johnson tackles a towering blaze, family rescue, and covert ops mission in “Skyscraper”, and a middle schooler can’t wait to leave a dreadful year behind in “Eighth Grade”. Meanwhile, Joaquin Phoenix plays a dryly humorous wheelchair-bound cartoonist in “Don’t Worry, He Won’t Get Far On Foot”, and Woody Harrelson and James Marsden take on the US Government in “Shock and Awe”. Story: Count Dracula embarks on a holiday cruise and falls for the ship’s captain. Starring Adam Sandler, Selena Gomez, Andy Samberg, Kathryn Hahn and directed by Genndy Tartakovsky. Story: Man-mountain with a prosthetic leg, Will Sawyer, deals with a burning skyscraper, and whoever framed him for its destruction, in order to save his wife and child. Starring Dwayne Johnson, Neve Campbell, Chin Han and directed by Rawson Marshall Thurber. Story: In search of friendship and self-confidence, Kayla has one more week of eighth grade to go before she leave for high school. Starring Elsie Fisher, Emily Robinson, Josh Hamilton and directed by Bo Burnham. Story: Based on the life of John Callahan who, crippled by a car accident at the age of 21, then became a controversial cartoonist. Starring Joaquin Phoenix, Jonah Hill, Rooney Mara, Jack Black and directed by Gus van Sant. Story: In the lead up to the 2003 Iraq War, a team of reporters dig into the claim that Saddam Hussein has weapons of mass destruction and are disturbed by their findings. Starring Woody Harrelson, James Marsden, Jessica Biel, Tommy Lee Jones and directed by Rob Reiner.